After a record sale to SunEdison, Imergy sees a bright future for its technology. Is lithium-ion the only type of battery worth considering for stationary applications and electric vehicles? Predicted price drops and the hype surrounding production increases make it seem so. But many dispute the idea -- including Imergy Power Systems' COO and President Tim Hennessy. In a recent interview with GTM, Hennessy pointed out the shortcomings of lithium energy storage and explained why he thinks that vanadium-redox flow batteries are a better alternative for stationary storage in many cases. When asked about Lux Research's prediction that the market for flow batteries could be worth $190 million (equal to 360 megawatt-hours) by 2020, Hennessy indicated that he thought the figure was way too low, "even if that's a per-year figure." And when asked what he thought about an assertion from Peter Gibson, sales director at LG Chem Power, that flow batteries are only good if you're looking for six hours of discharge, Hennessy wondered aloud what Gibson had been smoking. His views on Tesla and Elon Musk are equally provocative. "He's a genius at marketing, and the products look great -- but you can only market an uneconomical product for so long," said Hennessy. He is adamant that Imergy's own style of vanadium-redox flow batteries deliver cheaper, more reliable stationary energy storage than other battery technologies. Imergy will soon have an opportunity to prove itself. 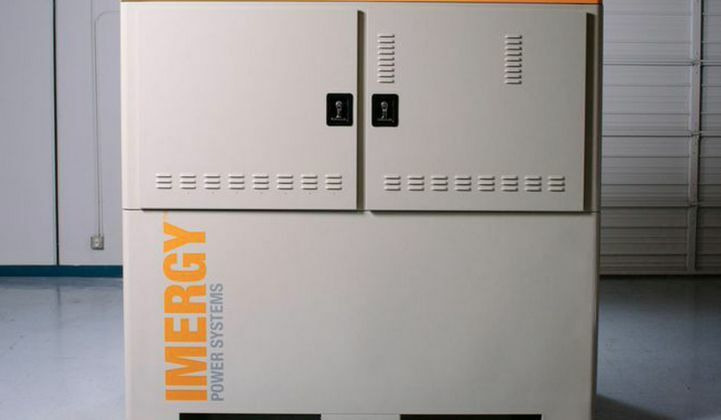 SunEdison recently ordered 1,000 ESP30 redox flow units from Imergy, to be delivered over the next three years. The batteries are destined for deployment in India, where they will store solar-generated electricity for off-grid consumers and businesses in rural areas. It's by far the biggest single order that Imergy -- or any other flow battery manufacturer -- has ever received. It's also a big risk. Hennessy admitted that it could be a major blow to the company if Imergy and SunEdison can't prove the advantages of vanadium redox flow with this large deployment. Prior to this order, the company had around 100 units in the field. So what persuaded SunEdison to make such a big order? According to Hennessy, they have much longer operating life spans, they are more scalable, and they become cheaper per kilowatt-hour stored the bigger they get. And they operate safely at higher temperatures -- an important attribute in most parts of India and Africa, where Hennessy foresees the technology having a big impact. Hennessy sees two distinct global markets. First is the off-grid world, where microgrids and domestic storage coupled with distributed renewables offer a cheap alternative to full-scale electrification. Renewables plus storage would replace costly, polluting diesel. This would also include some more economically developed parts of the world, including island communities such as Hawaii, where Imergy has already had some commercial success. The grid-connected world can benefit too, says Hennessy. That includes Germany, New York, California, Italy and Spain, which are seeing a rapid addition of renewables and, in some cases, legislative commitments that favor the integration of storage. "Here," he says "energy storage is like a sponge, a shock-absorber, if you will." As a result, the company is also targeting those markets, in addition to Africa and India. Hennessy laid out his argument for vanadium flow batteries, starting with price. Most of the physical footprint of a flow battery consists of plastic containers. Producing these is made even cheaper by outsourcing their manufacture to companies such as Foxconn, he said. High-quality vanadium, as used by many of Imergy's direct competitors, is expensive. However, the company utilizes recovered "dirty" vanadium, which is priced significantly lower. Hennessy says that Imergy flow batteries paired with solar can deliver electricity in Hawaii for 12 cents per kilowatt-hour, as compared to 40 cents for electricity from the island's grid system. Diesel-generated electricity in the developing world costs around 50 cents, as opposed to 10 cents for combined PV and Imergy storage. When it comes to longevity, flow batteries have a clear advantage over lithium-ion, which, says Hennessey, realistically "only have 2,000 or 3,000 cycles of useful life." Batteries deteriorate with each charging cycle. Generally speaking, flow batteries are no exception. Because they have charged ions of different elements crossing and re-crossing a membrane, inevitably the different elements become cross-contaminated, steadily reducing the cell's efficacy. Not so with Imergy's vanadium redox flow battery. The element can exist in different oxidation states, two of which are used in the company's cell, separated by a membrane. Because those ions are the same element, there is no deterioration in the quality of the electrolytes. Once the battery finally does come to the end of its useful life -- after 20 to 30 years, according to Hennessy -- its vanadium can be recovered and reused. Scalability is another advantage that Hennessy stresses. "With a lithium-ion battery, you need to add more cells to increase capacity. With a flow battery, you simply add more electrolyte. In other words, the bigger the flow battery gets, the cheaper it becomes per kilowatt-hour -- the opposite of a lithium-ion battery." So why does most of the world seem to be betting on lithium-ion right now? "It's a matter of confidence," he asserts. "Lithium batteries are backed by big, reliable corporations like Panasonic and Samsung. Say you're spending tens of millions of dollars on energy storage -- you want to know that if it fails, because it doesn't have the lifespan that's claimed for it, the company will simply replace it. But there's only so many times the supplier can do that before it's uneconomic."